“Please contact the server administrator at webmaster@localhost to inform them of the time this error occurred, and the actions you performed just before this error. If you email me a screenshot of the information you entered, I may be able to help. Well im disappointed, while the map seems to show every state of the US (i would want to see the us as one piece the same way it is with other states) some other nations like Azerbaijan aren’t shown. I agree that the tool is limited. I have a newer tool that has a better database of country outlines. I haven’t had the time to make it web ready. 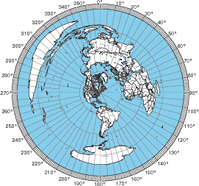 Is it possible to overlay the maidenhead system on a specific great circle map please? I think this is what you get if you select “Lat/Long grid” and “Label grids”. thanks a lot for providing this tool! I’m a SWL from Germany and i own a loop antenna, your map is just what i’ve been looking for. Is there an easy way to remove the radials and equidistant circle from the center of the map ? 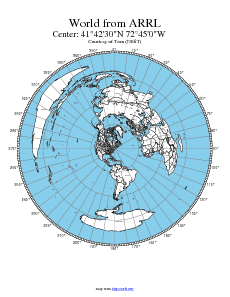 I want fourth grade students to compare azimuthal “daylight” on a hemisphere (distance = 10007) with daylight on the cylindrical projection that is used on dayandnight.com. The radials and circles can be a distraction for little kids. Sorry, I have too many other pressing things going on. Excellent, quick! Great job! Your efforts to develop this custom mapping tool are much appreciated. I put the map creater into homepage. I hope, you allow me this? See lower end of my German page. But on the European Card, United Kingdom and some others are not colored. See also the English page. Thanks for making a link to my map page on your site. Thank you the opportunity of azimuth map on my QTH. Great tool, I accidentally came across it while searching for an AE map centered over the N pole that can have plotted coordinates pinpoints. Do you have any plans to add something like this to your site? Alternatively, do you know of one? Thanks for making this and taking the time to read comments. The map generator keeps changing my coordinates by a fair amount from 47.225, -122.4030 to 47.133,-122.4010 which is far enough away to mess up pointing directions. Am I doing something wrong? Thank you for this azimuthal map generator. The maps are beautiful! I would like to add dots representing the locations of the stations with which I have made a QSO. 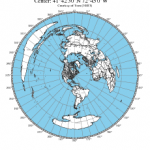 I have a QuattroPro spreadsheet that converts the longitude and latitude coordinates of the stations (from qth provided by the ham, or qrz.com or other web sites) into accurate distances and azimuth. The results are somewhat different from qrz.com’s results, by I am quite confident in my math. From there, I could manually place the dots on the azimuthal map centered on my station. I have no idea how I could make this process automatic. I don’t have anything to simplify this procedure. Fiji is not displaying correctly from my home location in NZL. colouring of the ocean is giving odd results. Changing this to 10000 it seems to be okay.